Raj was in a good mood today. There was nothing special but he was feeling happy. He went for the morning walk and met almost all of the people he liked. The nature was being gentle and a calm humid breeze was blowing. When you feel good, it seems everything around works in your favour. He stayed in the park for some while. It was not his regular schedule. He had lived his life with full discipline. Everything was done in a proper sequence and except Sundays you would not be able to discriminate others days in his daily life. Kids used to be at home and the office used to be closed which made all the difference. He never had big dreams and was satisfied with whatever he had. A small house, a beautiful caring wife and three lovely children. What else could someone dream of? Just then a football hit his head. Ahh, it was a plastic ball not a real one. A four year kid was playing along with her mother. He was mesmerized by his innocence and the excitement the kid showed for the ball. He for the first time was regretting that his children grew up so fast. He stayed there for some time watching kids and other elders. Life seemed different today. He stood and started walking to way back home. Just then he saw white roses. A road-side vendor had just taken out a bunch of full grown white roses and displayed it on the front. It was not his favourite, he liked red much more than any other color. But white rose had a much special meaning in his life. Memories flashed and he was there in his twenties. It was Valentine day and they were taking a stroll after the coaching classes. Today she was looking very pretty in her light blue suit with white dupatta. She stopped to pay her regards in the lord krishna’s temple. He ran to the nearby florist and asked for a red rose. It was shear bad luck that the number of romeos had grown so much that they bought out even the yellow roses. He knew that he would never get courage again so proposed her with the white rose. It has been long since he gifted her one. He had been busy with his job and she with the kids. He didn’t remember the last time he said the magical three words to her. He bought the rose and rushed home. The woman in her eighties took the rose with trembling hands. Her wrinkled face lit up and blushed like a newly married girl. “White roses, they have been my favourite.” She paused. '50 first dates', 'A moment to remember' and 'u, me aur hum' have depicted this story beautifully but it is still refreshing to read here . 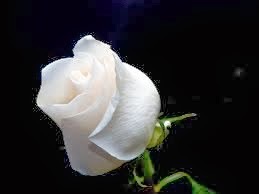 . .
beautiful article about white rose,thanks for sharing..